Our Finca del Sol with a total of 6 bedrooms, 4 bathrooms and 1 extra toilet is located about 40 km east of Málaga above the coastal villages Torre del Mar and Algarrobo Costa. A complete house just for YOU! Off the beaten track, only reachable by private roads, you find absolute peace and relaxation in our finca. For this reason, the holiday villa is only let as a whole - for sure, nobody will disturb you. 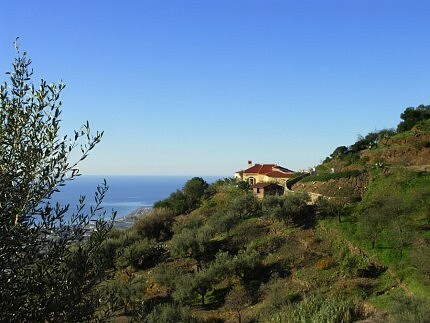 The whole finca is facing south, with fantastic sea view and all-day sun. On the photo you can see our Balcón del Mar, the sun terrace at the head of the pool. On the opposite side there is another large terrace which cannot be seen from outside. This terrace provides sun until sunset, if necessary, 3 awnings offer shade. On the east side of the house, there is our breakfast terrace with electric sun-awning. This terrace offers sun in the morning and shadow in the afternoon. The pool ( 8 x 4 m ) has stairs to get in and out. 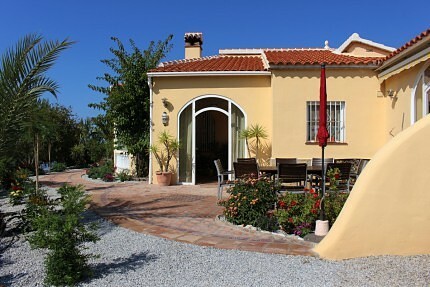 Finca del Sol is a detached holiday house located on a slope within a huge garden of 4000 square metres. The garden has several large and small terraces, almond and olive trees, palm trees, cactus, vine and many tropical plants. 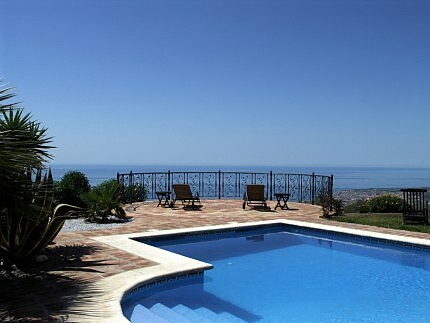 From the house, from all terraces and from the garden you have a fantastic free and direct view to the coast, Málaga, the sea and the mountains - on clear days even to Gibraltar and the African Coast. The coast and the beaches of Costa del Sol you reach in 15 minutes by car. The central location of the holiday house makes it a good base for excursions and day trips - you can explore all interesting towns, places, landscapes and attractions of Costa del Sol and Andalusia within about 2 hours by car. There is also a large variety of sports activities and leisure opportunities nearby. Finca del Sol is an exclusive holiday home with pool, total living space of about 240 square metres, 6 bedrooms, 4 bathrooms, extra toilet. The house is divided into the Main House, the separate Honeymoon-Suite and the Bodega in the back part of the property. 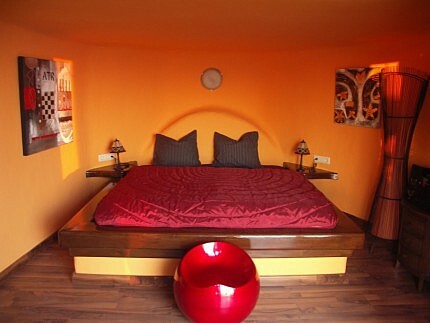 On the photo you see the 6th bedroom of the finca, the African Lounge with own toilet. 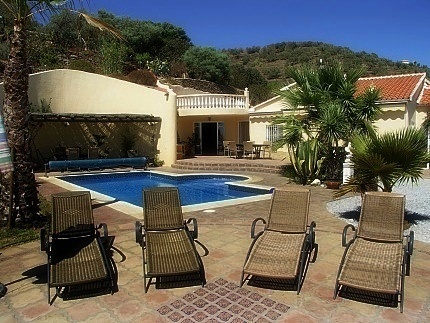 The finca has a swimming pool and several large, partly roofed terraces and a huge flowering garden on different levels. In front of the Bodega there is a summer kitchen with integrated barbecue - additional to the completely equipped kitchen in the Main House. Many terraces and the huge garden on different levels provide space for joint activities in a group, but also undisturbed places for relaxation and a lot of privacy.